CHASING FOOD DREAMS: The Tranquerah, Encorp Strand: Launching of Florence Tan’s Best of Nyonya Recipes in conjunction with The Tranquerah’s 1st Anniversary Celebration! The Tranquerah, Encorp Strand: Launching of Florence Tan’s Best of Nyonya Recipes in conjunction with The Tranquerah’s 1st Anniversary Celebration! A Nyonya, A Cookbook & An Anniversary! Time flies… a favorite Nyonya restaurant of mine turned One recently! It was a double happiness affair at The Tranquerah where the restaurant held a lovely event to celebrate Chef Florence Tan’s launch of her new cookbook and the restaurant’s first anniversary. The Tranquerah oozed with heritage charm that evening as the whole restaurant was set with old school memorabilia, authentic Nyonya cuisine and guests dressed in sarong and kebayas! Chef Florence had also prepared a sumptuous feast from the recipes of her new cookbook, Florence Tan’s Best Nyonya Recipes. The Tranquerah is synonymous with Malacca Nyonya cuisine, serving dishes of southern Nyonya from Chef Florence’s recipes. Having visited the restaurant a few times here and here, dishes are as authentic as it gets. Besides authentic cuisine, the ambience is unbelievably charming with lots of recycled furniture, décor, memorabilia and old school treats. The lovely Chef Florence was busy autographing her new cookbooks for guests as I arrived. She looked as beautiful as ever… must be all that delicious Nyonya food! Wink, wink!! Check out her latest cookbook, Best of Nyonya Recipes, showcasing an array of gorgeous and almost forgotten recipes. Recipes in this book are simple with easy to follow instructions. Sectioned into basic categories like Fish, Chicken, Seafood, Vegetables and Desserts, one should be happy to find lots of delicious Nyonya recipes like Otak Otak Belanga, Fish Pais, Tempera Chicken, Sek Chicken, Spicy Prawn Curry with Pineapple, Kerabu Lady’s Fingers, Mango Patchree, Bubur Cha Cha, Kuih Genggang and more to name a few. Guest lingers for some photos while the rest enjoy the evening with lots of food, candies and a candy making session! Alan Yun & another Partner… don’t you just love their outfits! That evening, we tasted signatures of The Tranquerah with Ayam Pongteh, Otak Otak Belanga, Gerang Asam Stingray, Asam Prawns, Squid Curry, Chicken Curry, Sambal Belachan with raw vegetables and a very delectable Mango Patchree. Every dish really stands out in flavors with lots of spices used. My first time savoring Otak Otak Belanga, mackerel fish paste cooked in curry, a truly sumptuous dish that made me want to eat more rice. Gerang Asam has always been one of my favorite at The Tranquerah while Ayam Pongteh remains the classic in my heart. Mango Patchree wowed me tremendously as this innocent looking side dish packed quite a punch in flavors. Strongly sweet, sour and spicy, I had fallen hard for this dish. Guess what? The recipe for Mango Patchree is in the latest cookbook so I have included the recipe at the end of this post… its Seriously Good! Ah… sweet childhood memories… a blast from the past! Candies, Rabbit sweets, iced gem cookies and even those small tubes to blow bubbles… I believe the adults had a great time reviving their childhood memories while the children enjoyed these to the fullest! 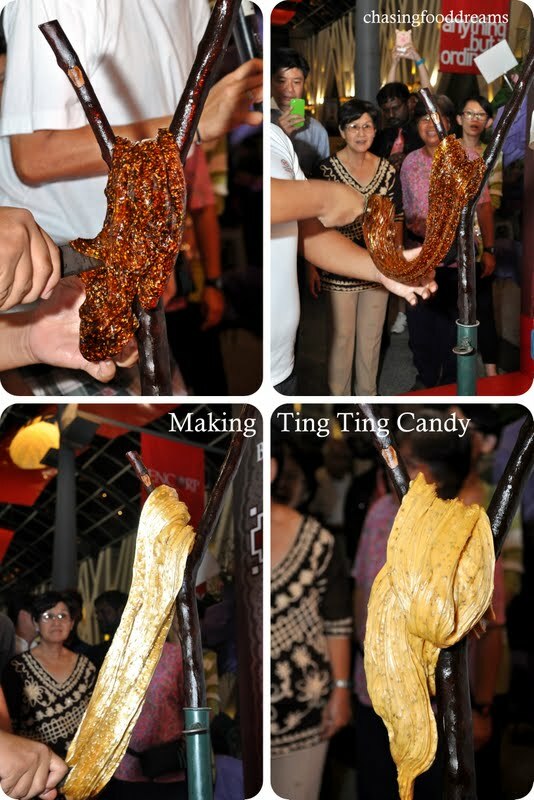 Here’s another old time favorite… Ting Ting Candy or Gula Ketuk. It’s really hard to find one now and Leo, 23 year old, was purposely hunt down by The Tranquerah team to make this nostalgic candy for guests that night! The art of Ting Ting Candy is almost gone but I am very impressed that this young man decided to continue his father’s legacy to make this candy. He cooked the candy mixture till caramelized and deep amber before swirling the mixture in a wok placed on top of water. Once the candy mixture has cooled to the correct temperature, he uses a Y-shaped tool to hang the candy and pulled till it oxidized and turn to the hard candy we all know. Guests were definitely amazed and charmed by this candy maker!! I was given a small piece that was still slightly warm. It was still pliable and taste really lovely. Once totally cooled, the candy hardened, therefore one has to use the steel utensils to break up the candy making the infamous Ting Ting sound! 1. Prepared poached mangoes a day in advance. Halve the mangoes and soak in salted water for 15 minutes. Drain well and set aside. 2. Bring water, sugar and salt to a boil in saucepan. When the sugar has dissolved, add mangoes. Cover saucepan and remove from heat. Do not boil mangoes again of they will become too soft. Leave to cool overnight. 3. Heat oil in wok. Fry finely ground ingredients and curry leaves until fragrant. Lower heat and add 5 Tbsp syrup from the poached mangoes, 2 Tbsp sugar and ¾ tsp salt. 4. Add chilies and cook for 5 minutes. Remove from heat and add poached mangoes. 5. Leave curry to mature overnight before serving. Psst… there is a Pineapple Patchree recipe too in the book! There are lots more awesome recipes so make sure to check out Florence Tan’s Best Nyonya Recipes cookbook available at all leading bookstore. Oh me oh my! She's all wrinkled, getting to be so old. Bet her foos is simply out of this world. This place is another one of Alan Yun's restaurants? Wow!!! He must be doing really well. Yes, Florence has been around the cooking scene for a long time... love her food too! yeah, the chili dip is nice but you have to try the Mango Patchree... its out of this world!! She is a fine Chef ! I enjoyed her shows !